1 Why Shiva is called Mahadev? 7 Why is Lord Shiva known as Mahadev? There are millions of gods in Hinduism. If you are interested in knowing, why Lord Shiva is known as Mahadev? Then, You will find this post helpful. The term Mahadev symbolizes the Supreme Lord referring to Lord Shiva. 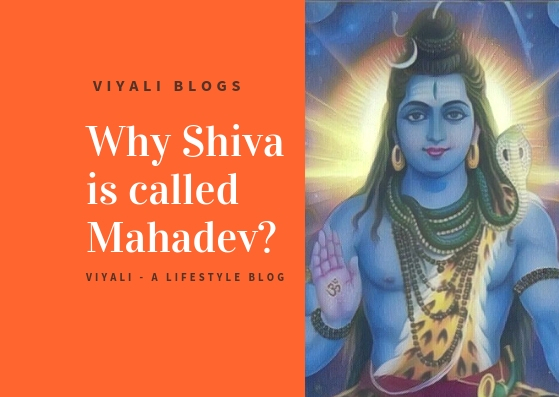 In this post, we have shared why Shiva is called Mahadev? As mentioned above there are millions of God in Hinduism, but all are the manifestation of Shiva's energy. In Hinduism, the ultimate form of God is Sadashiva which is shapeless in nature. Everyone emerges from him and dissolves in him at the end of the eon's (Kalaalantar). Brahma, Vishnu also appeared from him. Shiva means someone who doesn't exist, but everything comes from him. Shiva is absolute voidness, and that form of Shiva which is shapeless in nature is Sadashiva. Lord Vishnu emerged when Sadshiva thought to create someone who could handle all the responsibility of Shiva. That very moment highest form of Shiva became Vairagi. Lord Vishnu Mediated for several divine years to get all the knowledge, during that period Brahma emerged from Vishnu's navel lotus. Sadashiva appeared as the infinite fire pillar in between Vishnu and Brahma and announced Narayan as the Omniscient Lord Vishnu for his righteousness whereas, abandon Brahma for speaking lies to Vishnu. Both, Lord Vishnu and Lord Brahma requested Sadashiva to take some form so that they could worship him. For fulfilling their wish; Shiva appears in the form of Rudra. Rudra is the physical form of Shiva, also known as the cosmic roar of Shiva. It is the terrible manifestation of Shiva which is wild in its fundamental nature. The auspicious form of Shiva is Lord Shankara. Brahma is Creator, Vishnu is Preserver and Shiva is the Lord of Destruction. One Kalpa is one day for Brahma; One Kalpa includes one thousand maha yuga. One maha Yuga has four yugas in them SatyaYuga, Treta Yuga, Dwapara and Kaliyuga. Within a day, Lord Vishnu works with 100 Brahma's. Within a day, Shiva works with 100 Vishnu's. Shiva is the cosmic womb of the universe known as the Hiranyagarbha. Therefore, Shiva has no starting and ending point. He is limitless, omniscience, unborn, great Lord. There is no one like Mahadev; he is pure consciousness. The conqueror of death, and Mritunjay In in every aspect of life. Vedas glorifies him as the darkest energy and matter. Now it is the significant portion of the post which will help you to understand the reality of the primary existence. There are many Lokas in the well-known and unknown universe. The concept of multiple universes is called the multiverse. They work in their respective dimensions in which Lord Vishnu's Vaikuntha, Brahma Lok, Tapas Lok, Yaksha Loka, Gandharva Loka, Swarga Loka, Pitra Loka, Yam Loka, Patal Lok, Sukshma Lok, Dirgha Lok, and Gow Loka. These all Lokas are far from each other. These are the various dimensions of the world which are far superior to our Loka, MrityLok. They have hybrid technology in comparison to us, and energy is the basic unit everywhere in these Lokas. When the soul leaves the living being, it migrates from one Loka to another Loka in search of Moksha. If it doesn't get a place anywhere then, it revolves around the horizon of our Loka, MrityuLoka (earth). Therefore, Mahakaal is another name of Shiva which means Shiva is beyond time, space, death and holds foremost place everywhere. Kailash is the highest realm. The mount Kailash which we see on the earth is just a manifestation of Kailasha. It is the reason no one ever conquered it. Kailash contains all the Lokas in it, Goloka is one of them. Many godly beings (cows, peacocks, swans, pigeons, sages) live there under the blessing of Lord Krishna. Shri Krishna is their King, and Radha Rani is the queen who takes care of every cow. Shiva is Aradhya of Krishna; therefore, Shiva gave authority to Krishna to rule entire Goloka. Although, Shri Krishna is the personification of Lord Vishnu yet Goloka sustains higher position than Vaikuntha which is Lord Vishnu's realm. Still, Goloka is not free from materialistic disorders like Krodh, Moh, Maya but Lord Krishna is free from them. On the other side, Ram Naam resides in the heart of Shiva. Shiva is the Lord who exist in two state one is physical in nature, and other is not. The physical state of Shiva is auspicious Bhole Nath. In the physical state, Shiva is Adipurshusa who sometimes loves to live in the dense forest or seldom in the conditions of mount Kailash. In the physical nature of existence, There are many lessons which we could learn from Shiva. These qualities of Shiva defines him why Shiva is called Mahadev. Why is Lord Shiva known as Mahadev? Shiva's Natraj dancing form shows his dance of creation and destruction which resides in every matter, atom. Master of the universe still Owns no roof. Neelkantha - The immortal is the greatest giver. Adiyogi or Adiguru theLord of yoga and meditation. Shiva gives equal respect to his spouse Goddess Parvati. Aghor Shiva, Who is not extreme in any aspect. In this post, we have shared the information Why Shiva is called Mahadev? Last but not least, please keep smiling and stay blessed. A complete guide to type and benefit of Rudraksha defined by Shiva himself.